Sterilization Equipment Market size was valued at USD 5.6 billion in 2017 and is expected to witness more than 7.2% CAGR from 2018 to 2024. Technological advancements rendering effective sterilization of medical instruments is forecasted to boost sterilization equipment market growth during the foreseeable future. Advances in radiation sterilizers aid to reduce carbon footprint and undesirable radiations. For instance, radiation sterilization technology is being largely utilized in operating theatres, single-use medical devices due to advancements including radiation robots that generate no ozone. In addition, radiation sterilizers generate minimal secondary contaminants making it safer, thus eliminating negative impacts on environment. Such advancements will impel sterilization equipment market growth in projected period. Increasing number of surgical procedures owing to escalating geriatric patient pool, chronic diseases and rising number of road accidents will potentially spur sterilization equipment market growth. As a result, there are numerous surgeries performed in hospitals, clinics and ambulatory surgical centers. Such healthcare facilities need to be compliant with strict sterility guidelines set by health centers and government. This will lead to more demand for sterilization equipment in healthcare facilities to prevent healthcare-associated infections (HAIs). Aforementioned factors are set to offer lucrative market growth over the forecast timeframe. Growing need for sterile conditions across healthcare & food and beverage industry will positively impact sterilization equipment market business growth. For instance, in 2018, Porter Adventist Hospital was involved in a sterility breach that had potential to harm patients with HIV and Hepatitis B pathogens. This breach is credited to improper and inappropriate sterilization and infection control. Such incidences can infect and seriously harm large patient population that may lead to death. In order to avoid such threat, sterilization is mandatory in healthcare set-ups, that will lead to greater adoption of sterilization equipment in recent years, thereby fostering sterilization equipment market growth. However, high cost of sterilization equipment will negatively impact sterilization equipment market growth. Strict regulations laid by various regulatory bodies can potentially restrict industry growth during the upcoming years. Filtration sterilization equipment dominated in 2017, with segmental revenue of USD 3,302.8 million. Filtration sterilization is largely employed in food and beverage industry, research labs as well as pharmaceutical industry to achieve sterile filtration of liquids and gases. Recent advancements in filtration sterilization techniques have enabled rapid adoption of this method. Technological advancements in filtration sterilization include nanofiltration, continuous filtration process and ultra-filtration that helps by reducing sterilization time along with prevention of product loss. These benefits will facilitate accelerating demand for filtration sterilization in forthcoming years, thereby augmenting segmental growth. 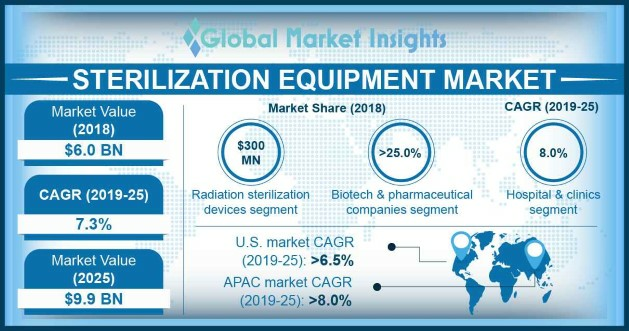 Heat sterilization equipment market will grow at a momentous rate of 7.7% during the forecast timeframe owing to high penetration power of heat that enables efficient sterilization of medical instruments. Similarly, steam sterilization is broadly used in dental clinics, hospitals and ambulatory surgical centers. Technological advancements in the conventional autoclave structure will lead to increasing demand for heat sterilization equipment. For instance, flash sterilization benefits the end-users by allowing instant usage of autoclaved equipment just after sterilization. Such advancements will favour segmental growth in recent years. Biotech and pharmaceutical companies segment held largest revenue share of 29.1% in 2017. Sterilization in pharma and biotech companies is of utmost importance to deliver pathogen free products. Every component that is utilized in manufacturing of drugs and biopharma products needs to be free of pathogens and safe for usage. Hence, growing healthcare infrastructure and increasing disease burden will support pharma and biotechnology industry growth, thereby increasing demand for sterilization equipment in forthcoming period. Hospitals and clinics segment will grow with a remarkable rate of 8.1% during the forecast timeframe. The segmental growth is attributable to rising awareness within the healthcare industry to prevent and control healthcare-acquired infections. Regulatory bodies are concentrating efforts to improve infection control and sterilization of medical instruments in hospitals. For instance, The Asia Pacific Society of Infection Control instructs hospitals to strictly follow written guidelines of sterilization for hospital instruments. Stringent regulatory scenario will favour sterilization equipment market growth in the upcoming period. U.S. sterilization equipment market contributed to the largest revenue of USD 1,975.2 million revenue in 2017. There is increasing awareness and numerous initiatives to implement sterilization practices, set by various regulatory bodies throughout U.S. U.S. largely adopts technology advanced sterilization equipment that will further result into substantial market growth. For instance, low-temperature sterilization is widely used in U.S. due to growing demand for medical devices made of materials that require low-temperature sterilization. This will foster regional growth in foreseeable years. India sterilization equipment market is forecasted to grow at a rapid rate of 9.7% CAGR, owing to rising number of surgical procedures due to escalating incidence rate of infectious and chronic diseases coupled with growing geriatric population. Increasing healthcare expenditure and R&D activities, leading to introduction of newer technological devices and drugs will contribute to boost in market growth. Moreover, greater usage of high-end technology equipment will drive industry growth in India in upcoming period. 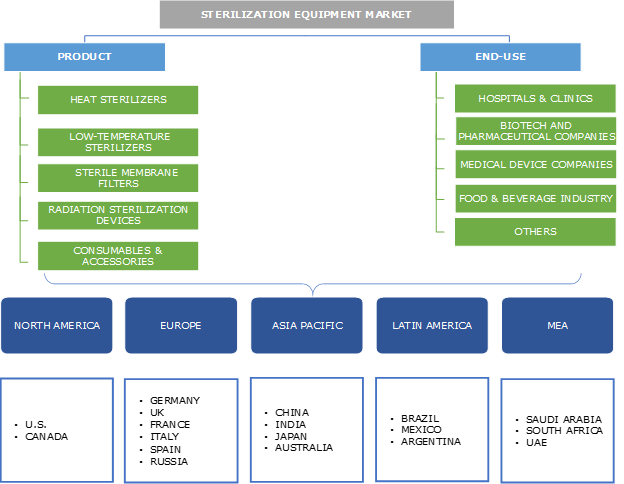 Few of the notable industry players operating in global sterilization equipment market are 3M, Advanced Sterilization Products Services, Anderson Products, Belimed, Boekel Scientific, Celitron, Fedegari Group, Getinge AB, LTE Scientific, Matachana, Merck, Midmark, MMM Group, Steris Corporation, TSO3 and Tuttnauer. These companies are opting novel product launch, mergers and acquisitions to sustain business in sterilization equipment market. For instance, in February 2018, Getinge Ab installed its first STERIZONE VP4 in Europe, thereby penetrating in the European’s low temperature sterilization market and strengthening firm’s geographical presence. Rising number of HAIs and technological advancements in sterilization equipment will stimulate sterilization equipment business growth during the forecast period. Moreover, accelerating number of surgeries in developing countries coupled with developing healthcare infrastructure will augment faster adoption of sterilization equipment, thereby supporting market growth.